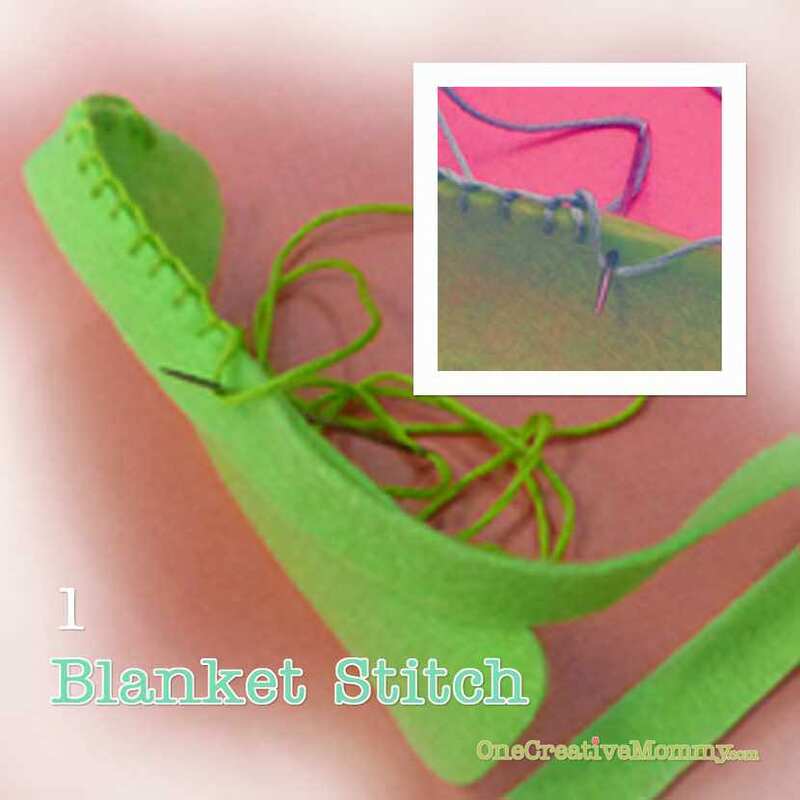 You will also need to know how to sew a basic blanket stitch or whip stitch. 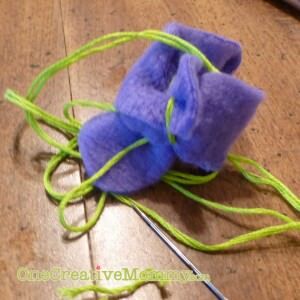 Links to video tutorials can be found on my felt sandwich post. (See blanket stitch image.) Lay the strip on top of the popsicle shape so that the edges are even. Begin toward the bottom of one side, and stitch around the entire shape, using a blanket or whip stitch. When you get back to where you started, slip your needle under your first blanket stitch and pull it through. (This should finish the edging so that you can’t tell where you began and ended. Using your fingers, pinch the two sides of the strip together and stitch the pieces together. Finish by knotting on the inside. 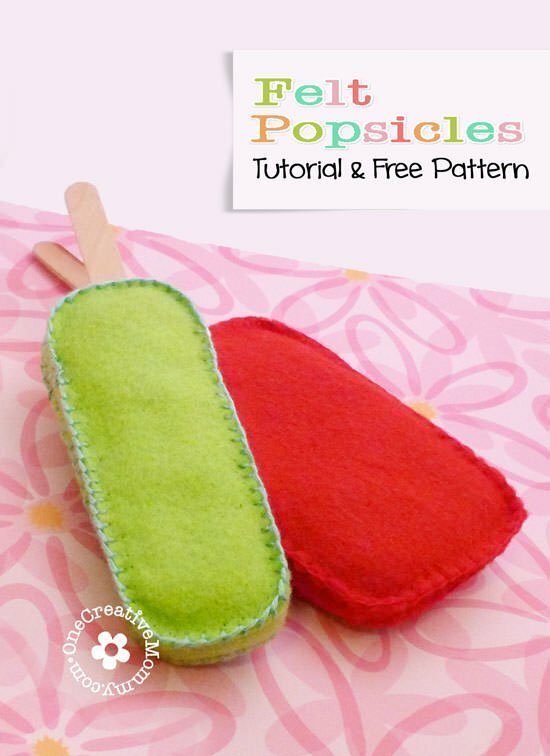 Cut extra felt, fleece, or batting slightly smaller than the popsicle shape to use as stuffing. 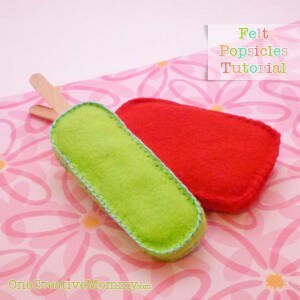 (Optional–If you want your popsicle to keep it’s shape instead of flopping over, cut a piece of strong cardboard to use as stuffing along with the fabric.) 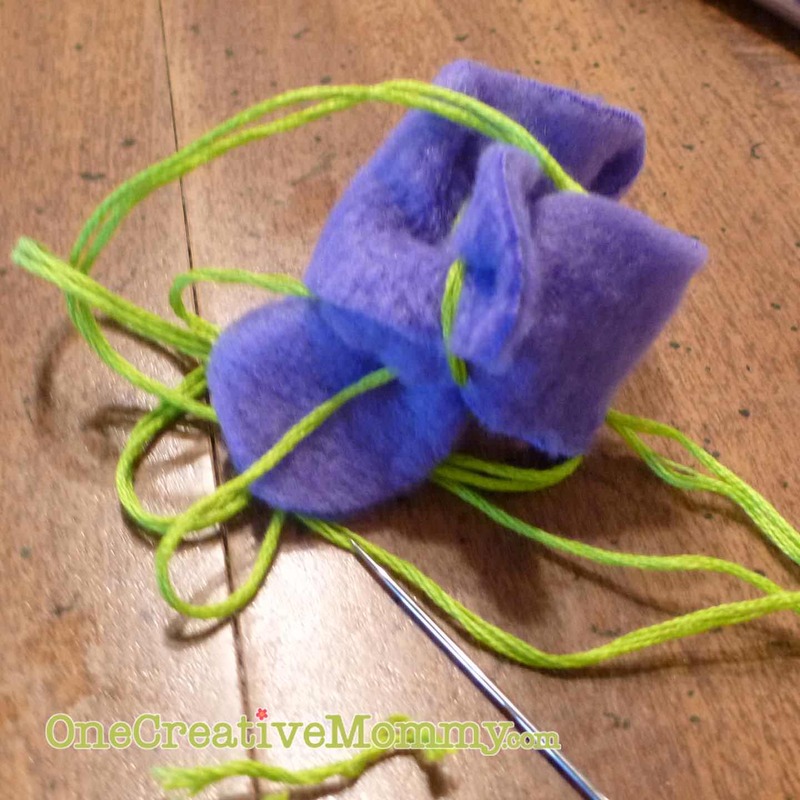 In this tutorial, I used fleece, felt scraps, and cardboard. Make a stuffing sandwich: Fleece, cardboard, fleece. 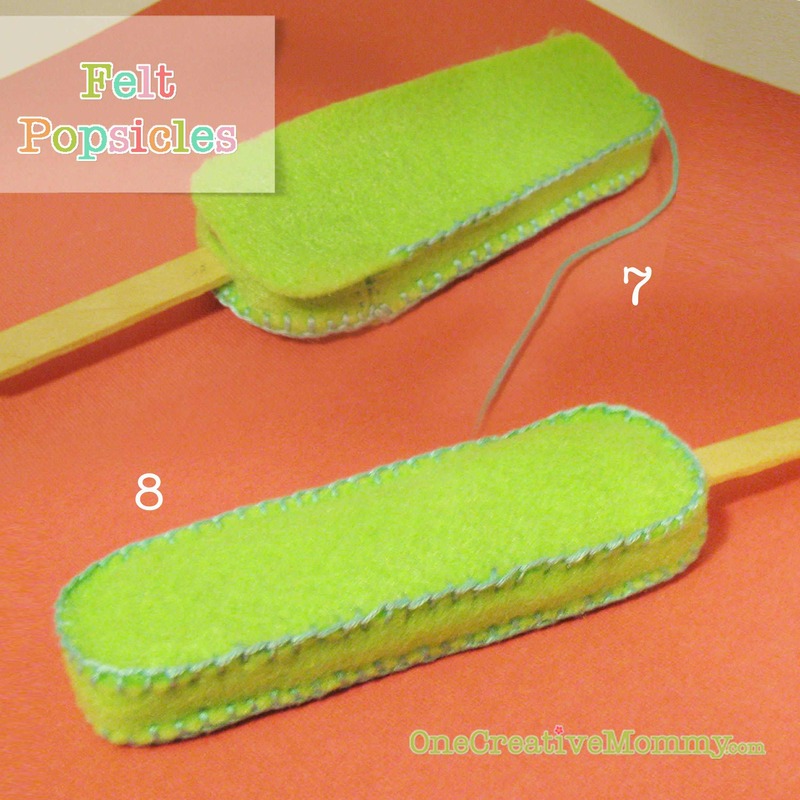 Using sharp scissors, snip a hole in the bottom of the strip–just large enough to slide a popsicle stick inside. 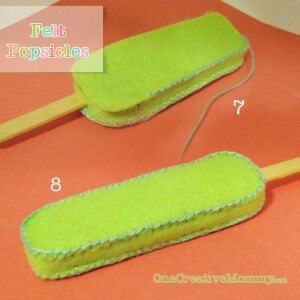 Lay a piece of fleece and the cardboard inside your popsicle, slide in the popsicle stick, and tape it to the cardboard. 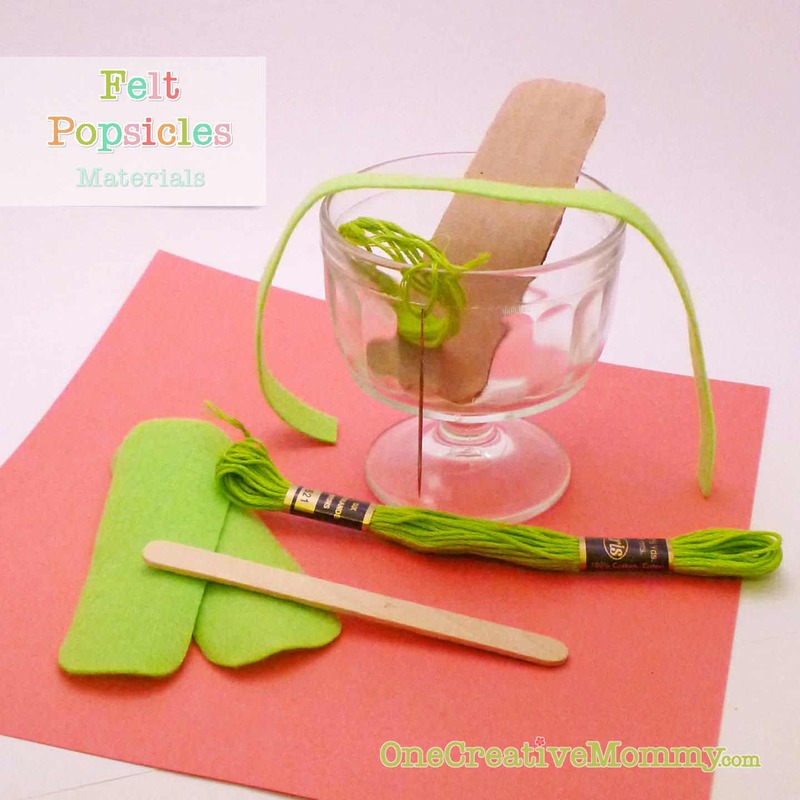 Surround the popsicle stick with a layer of filler. Add the second piece of fleece. 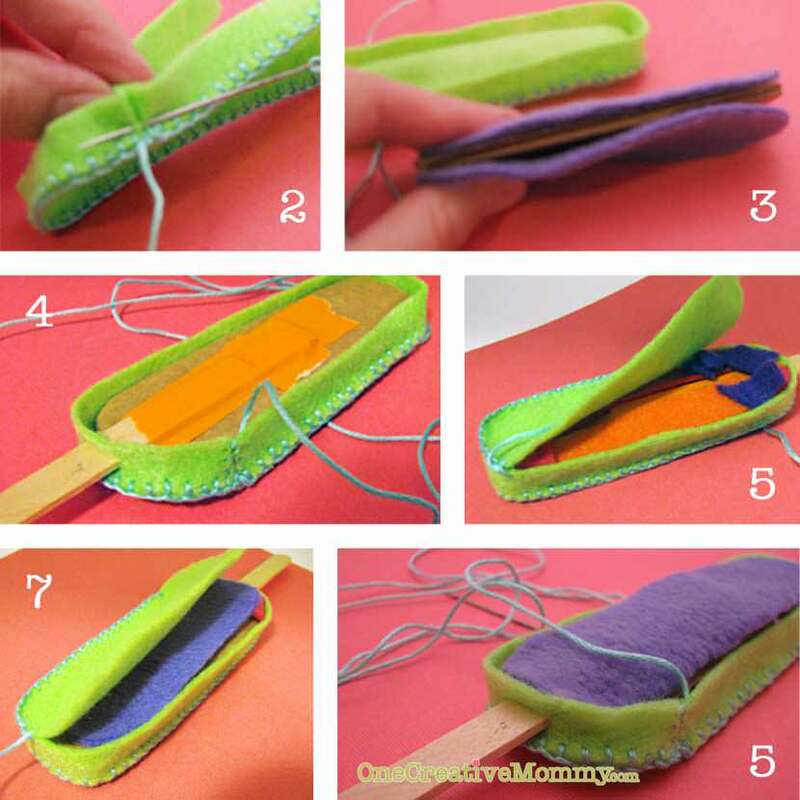 Add the second popsicle shape and blanket or whip stitch it in place the same way you did in step 1. 8. You’re done! Start over with a new color or shape. Just FYI–the red popsicle pictured in the first image does not have a piece of cardboard inside. It is much more flimsy than the green popsicle, but it is softer. Click here to see all the fantastic sites I like to link up with each week. These are great!! I would love it if you would share them at my link party Sharing Saturday. 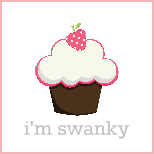 It will open on Friday night at 9 at http://craftymomsshare.blogspot.com/. Oh I love handsewing and this looks fun! always on the look out for play food. than k you! pinning! Very Cute! I always love original felt food creations! WOW!! these are like, amazing!!!! can’t believe how good they look. you did a brilliant job!!! Those are really cute! Thanks for sharing. so fun, though I’m sure my two year old would constantly try to eat them…I came over from NapTime creations link up, I’m excited to see more of your creations. These are so adorable, and they look so easy! Visiting from Titus 2sDays! These are so cute!! Thanks for sharing. Super cute! Thanks for sharing at The Fun In Functional! Such cute popsicles! They look absolutely fabulous! Oh WOW!! So cool!! And how sweet of you to offer a free pattern! In love with these cute popsicles and food! Thanks for sharing on “I Gotta Try That” Hope you entered the giveaway while you were there. Those are so much fun! And zero calories – yay! hi! 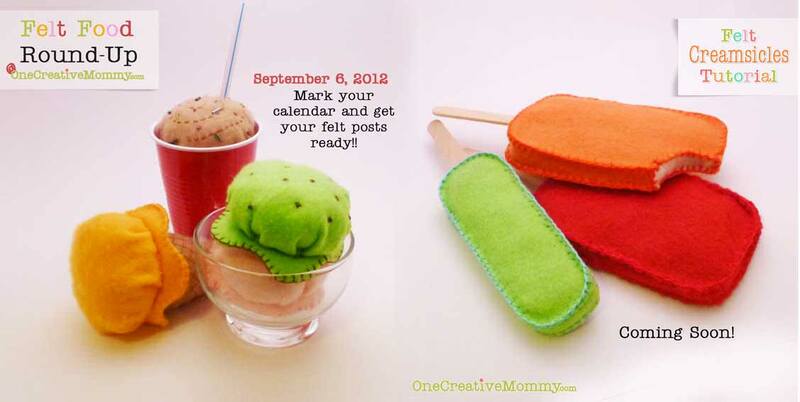 Thanks for linking this project to Nap-Time Creations Tasteful Tuesdays. Just wanted to let you know this will be featured at the party this week. Hope you can come by and check it out! Grab a featured button if you dont already have one! This link will go live at 8:30 central time Monday night! So cute! This looks like so much fun! Thanks for sharing on Tout It Tuesday! Hope to see you tomorrow. These are so cute! Thank you for sharing it last week at All my Bloggy Friends – I can’t wait to see what you link up at this week’s All my Bloggy Friends! Use a cheap foam brush inside the popsicle! gives it some stiffness/body, and the stick will not come out! What a great idea, Jan! Please let me know when your site is up. I’m excited to check it out. Thanks for the easy and short tutorial. I shall definitely dig out my embroidery threads and needles for this one!